Power up your mobile devices anywhere and everywhere with the LAX Power Adapter Plug with 6 Ft Black Micro USB Adapter Cable. Home Quick Charge Wall Charger with Micro USBCable! Putting some more juice into your smartphone, tablet or wearable is fast and convenient with the LAX Wall Charger Adapter with a USB C cable. The smart technology and durable design make our charger kits unbeatable quality. Leave this small yet powerful wall charger adapter in your home or office to keep your phone at full capacity. ✔Wall Charger with Intelligent Circuit - Protects against short-circuiting, over-heating, and current surges. it will stop charging your phone or tablet when the battery is full. ✔ 6 Ft Cable - Sitting in café, library or on your bed can be difficult if your charging cable is not long enough. Our 6ft. Micro USB cables allow you to sit wherever you please. ✔Braided Nylon Cable - No more weak plastic wires that get tangled or start to fray at the ends. LAX flexible Micro USB cables offer extreme durability. ✔ Copper Wires - Our cables have copper wires, to promote maximum signal quality and strength, for faster charging and synchronization speeds. This compact wall charger packs a powerful punch! Don't underestimate the efficiency of LAX power chargers. The smart USB to Micro USB port charger will quickly identify your mobile devices, to provide fast and compatible charging. Output 2.4 amps.  KEEP THE MUSIC PLAYING OR SELFIES COMING WITH YOUR PHONE ALWAYS FULLY CHARGED - The colored pro charger set is designed with functionality, practicality and aesthetics. It will fit perfectly into your two prong outlets and looks small and discreet. Available in black, gold, silver, rose, gray, red charger plugs and charger wires for all mobile devices. 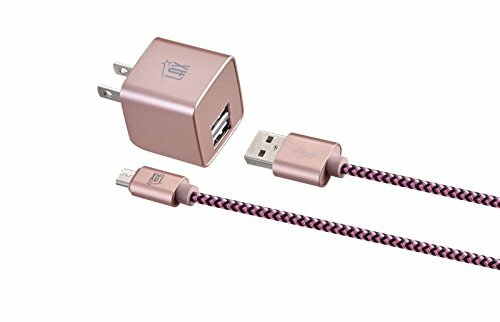 ⚡ 6ft LONG CHARGING CABLE MICRO USB - Micro USB charging and syncing cable for all compatible devices, is made with ultra-strong braided nylon to ensure that the cable is durable, protected, tangle free, and flexible. Sit comfortably with your phone regardless of where the outlet is. LAX Micro USB cable will top up your smartphone, tablet or wearable in the fastest possible time.  SMALL YET POWERFUL CHARGING - Even though LAX gadgets may look cute and compact don't underestimate the power of the LAX rapid wall charger. The smart USB to Micro USB port will quickly identify your mobile devices, to provide fast and compatible charging. The USB port has an output of 2.4 amps. ⚠ CERTIFIED SAFE WALL CHARGING PORT- LAX cables and USB chargers are fully tested and certified for all safety standards. The quick charge adapter features an intelligent circuit design that protects against short circuiting, over-heating, and current surges. The small wall adapter plug for Micro USB phones will also prevent over-charging and surge protection, it will stop charging when battery is full. ⚡ COMPATIBLE WITH - LAX Micro USB Cable is compatible with Samsung Galaxy S6, S6 Edge, S6Edge + / S5 / S4, Samsung Galaxy Note 5 / 4, Most Android Smartphone, BlackBerry phones, Amazon Kindle, Sony PS4 / Xbox, Nintendo DS, GPS Devices, Portable chargers, Cameras and more. If you have any questions about this product by LAX Gadgets, contact us by completing and submitting the form below. If you are looking for a specif part number, please include it with your message.